Pero siempre hay un barco que naufraga en Madrid. But there is always a ship that wrecks in Madrid. "Yo Me Bajo En Atocha"
"I'm Getting Off In Atocha"
In the above left column is the flag of the city of Madrid. Don't confuse it with the flag of the province of Madrid which has 7 white stars on a red background. On the right is a close-up of the seal. It is really not known what is the significance of the bear standing against a madroño tree. One theory is that it has something to do with a dispute over farming rights between the clergy and the citizens. You notice that the border of the shield also has seven stars much like the flag of the province of Madrid. In fact the seven stars on the flag of the province of Madrid comes from the seven stars on the shield of the city of Madrid. 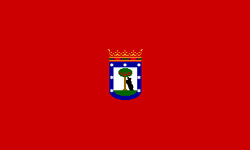 But, on the flag of the province of Madrid there are only five points (to represent the five provinces that surround the province of Madrid), unlike the six points on the stars in the city of Madrid. The seven stars supposedly represent the seven stars in the Plough constellation which is close to the Ursa Major (Great Bear) constellation. Upon being first conquered Madrid was designated to be the seat of royalty and the government. The seven stars in the Plough constellation represent the North. Therefore they took the Plough constellation to be the seat of government of the heavenly bodies and therefore used it to represent Madrid, the new seat of government. 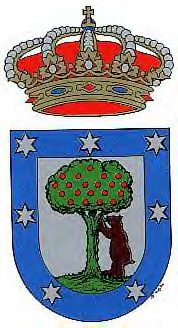 The city of Madrid is located in the Community of Madrid (La Comunidad de Madrid). The Community of Madrid is located almost exactly in the center of Spain. The city of Madrid is located almost exactly in the center of the Community. Click here to see a series of maps which will show where the city of Madrid is located. After you are done remember to return to this page. At the bottom you will be given an opportunity to go on a "walking tour" of Madrid. Madrid was not always the great city it is today. It was not even the designated the capital of Spain until 1561. Before the Moorish invasion is was a rather small village. It owes its name to a fort that was built by Mohammed I called the alcázar (fort) of Majerit. Majerit is an Arabic not a Spanish word. Through Spanish pronunciation it evolved into the name "Madrid". Madrid was captured by Alfonso IV in 1083. Upon entering the city he discovered a statue of the Virgin Mary by a granary (almudín). He dedicated a church to the Virgin of the Almudena and declared her the female patron saint of the city. Although kings continued to visit Madrid it wasn't until 1561 that Philip II moved the palace (and therefore the seat of government) from Toledo to Madrid. The palace burned down in 1734 and was replaced by the Palacio Real which still stands today. The Virgen of the Almudena is the female patron saint of Madrid. Her feast day is November 9th. The male patron saint of Madrid is Saint Isidro. He was a 12th century farm worker noted for his humbleness. His feast day is on the May 15th. During a 20 day celebration period the most important bullfights in Spain take place at the Plaza de Toros Monumental de las Ventas bullring. There are also verbenas (fairs) and romerías (local festive pilgrimages). Madrid is Europe's highest-lying capital. It is situated almost in the center of the Iberian Peninsula. It has a present day population of about 4 million. It's temperatures ranges from cold, yet sunny in the winter, to very hot in the summer. "Nueve meses de invierno, tres meses de infierno", the saying goes, "nine months of winter, three months of hell." The truth is, there is very little extreme. Certainly, Madrid can be stiflingly hot in July and August and there might be a little snow on the roofs for a couple of weeks during the winter, but the temperatures in March, April, May & June average from lows of 40 - 60 (March) to 60 - 80 (June). So in reality with the exception of only a few months the temperature is quite moderate and comfortable. It's Motto is "Limpia, fija y da esplendor" - "clean, fixes and gives shine"
While Madrid is home to many sports the city's favorite sport is fútbol (soccer). The powerhouse team, not only in Madrid, but arguably in Spain and even Europe is Real Madrid. Another popular local team, although in the second division, is Atlético de Madrid. Finally there is the much smaller third division team Rayo de Vallecano. One of the best known musical entertainers of Madrid is Joaquín Sabina. He not only wrote and sang the song "Yo me bajo en Atocha" (see the beginning of the page), but has written or co-written over 125 songs, many which are based on his love of Madrid. He is truly one of the living symbols of Madrid and while he may not be well known in the United States he is an International Star. With this "walking tour" we will attempt to take you around the city pointing out to you the historical sights, monuments, buildings and parks. To start your walking tour of Madrid click on the picture of Joaquin Sabina. On the first page you will hear the music from his song "Sin Embargo" (Nevertheless). Can't see him or it doesn't work then use the link below.
. Your number 1 source for Java!